Delhi saw Asia's biggest business of fashion event in the past 5 days. The 22nd edition witnessed 160 designer's immense hard work in the 30 shows. The 5 day event brought forward national and international buyers for the designers. I attended day 04 of the event. 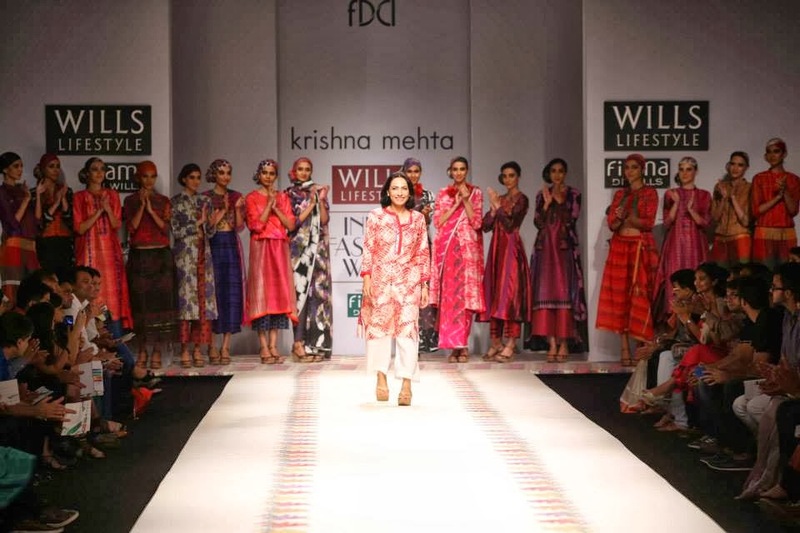 The fashion show was of Krishna Mehta a tremendous designer who is much known for her work in traditional weaves and textiles. The show was dedicated to the Weavers of Varansi. The show unveiled the exclusive designs on cotton clothes. 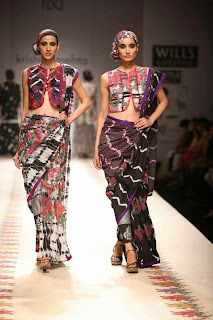 The use of chanderi was done along with frills, prints, floral designs, embroidery, block prints and a lot more. Being diverse with the colors, Krishna Mehta introduced the use of trousers, drapes, tie and dye, all together in one outfit. As the collection was of spring- summer, the designer kept in mind to use bright and subtle colors which go perfect and look artistic as well. Saree had the block prints which dwell easily in all festivals or functions. 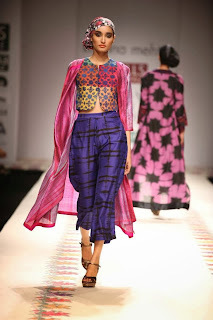 The trousers comprised of block prints, tie & dye, printed silk, brocade and linen print. What surprised me the most was the fact that the designer chose to use sharara with the organza jacket. As the people residing in India very well know that sharara came and went out of fashion in no time, but this new effort of the designer actually worked well. The drapes which are usually not too long happened to be till legs in Krishna Mehta's fashion show which were looking good with the prints. 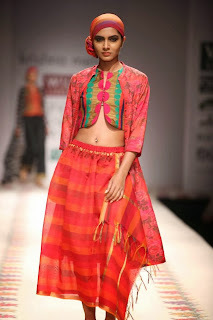 Some of the outfits were even identical to the kaftan look which is quite "in" in Delhi these days. Non of the outfits were sleeveless. Instead the sleeves were of half or 3/4th quarter. The heels worn by each model had the floral print (mind my words: print) and the colors used for the heels were mostly dull and light colors going in contrast. All the heels were block heels and none of pencil ones. 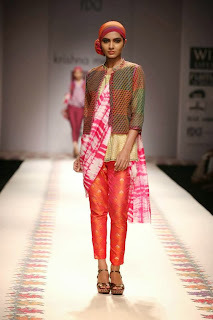 Shrugs and indian type blazers were put upon the saree in a few outfits, making the outfits more colorful. 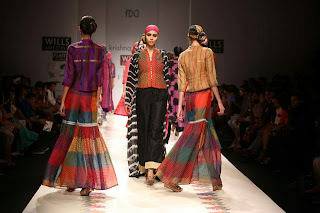 Overall the event was a huge blast and it gave a new innovative look to woven outfits. Dress: Forever New; Heels: Aldo; Neckpiece: Thrift. Hey! This is an interesting blog! Good photographs and thanks for all the details!